When it first became popular, Instagram was known as the photo-sharing social media platform. Facebook was about giving your friends a live update as to what you were doing, Twitter was helping its users flirt with 160 characters at a time and no one was really all about the photos. But when Facebook brought the platform two years later in 2012, they slowly made changes to the algorithm that made it just as important to write good captions as it did to have good eye-catching photos. After all, Instagram’s robots don’t have eyes, so they can’t actually SEE the photo, so you have to tell it what the photo is about. Side note – when I was running ads in December for a hashtag training webinar, I had someone comment on my advert telling me that it was trendy not to use hashtags any more. I responded that it was cool that she thought that she didn’t need to use hashtags, but considering she had the same follower count as I did but had a quarter of the engagement, I wished her luck in a hashtag-less world, and proceeded to train business owners who want to learn! There are 4 important steps to make a great caption on Instagram, here they are broken down. Ever noticed how Instagram shows the user just the first few lines of text underneath a post? That’s your 2nd chance to entice the reader to click “more” and read on, the first being the image that made them stop scrolling. The caption can be as long as you like (up to 2200 characters) but this is your chance to really connect with your audience by doing any of the following to build that know, like and trust factor. Although not proven or had the record set straight by Instagram officially, it’s said that the use of emojis can help your post stand out. Emojis can invoke emotion in a way that is usually quite funny and charming, which helps you better connect with your audience. Not an emoji user? No, me neither, but even something simple like using the camera emoji at the end of your post to depict who took the photo can work too. Line breaks are always useful; it helps your reader split up the text in their mind, especially in this day and age when people skim read. It’s also great to use line breaks (or full stops) to separate the caption from the hashtags as that helps the human reader know when to stop reading. Anything that keeps the reader reading the caption will help your engagement. Ever used different fonts? I’m betting that you are not familiar with this as not many people do it, or know that it’s possible. There are some font changes out there like Yay Text that can change your text into different fonts. I like the posts that only change a few words to make them stand out – I think it works really well. Without a call to action, you are not invoking an emotional response to your post. Chances are, if it resonated with your target audience, you will have made them feel like they belong reading your post, so they will gladly take action. Ever seen an IGTV or a story where you felt like the person was speaking directly to you, then you took action because it was totally you? That’s what you are trying to do with your followers. If you want some more insight into what kind of hashtags you should use, take my quiz here to find out. Hashtags. A dirty word for you or are they just plain boring? I get ya, I’ve been there, sitting on my sofa on my phone, wracking my brain figuring out what kinda hashtag I should put next on my post. The secret to having a great relationship with your hashtags is definitely not trying to magically think them up as you are posting. That’s something that I will help you get out of. Not only will you be able to sit back and relax once you’ve written your fab caption, but you won’t have to worry about hashtags for 2 months, or thereabouts. How is that possible? By spending 60 to 90 mins today researching hashtags in your niche. Once you do the research, you can separate your hashtags into sets and use an amazing app to put them together for your post. So are you ready to forget hashtags for a bit?! I do advise doing this on a desktop, but only because it’s more comfortable to type. Open up two programmes: Instagram on your browser and a notepad (or Word doc). On Instagram, type the hashtag symbol followed by the main thing that you do – so #yoga #businesscoach #homemadejewellery #fitnessinstructor etc. Before you press return, take a scroll down the list of hashtags and start typing some of them out onto your notebook. Try and choose ones that are relevant still to what you do – so for example if you are a Yoga instructor and teach in classrooms, don’t use the #YogaOutside hashtag (unless you then do a post of you doing Yoga outside). My best advice when doing this is to only choose hashtags that have more than 1000 uses of it, but less than 1m. Too few uses means there won’t be many people searching for that hashtag, but too many and you won’t be found in all that competition. Try this with a few more keywords from your niche until you get a healthy bank of hashtags written down. Now find an influencer or two in your niche who has great engagement. Look at their profile and their posts so that you can see what hashtags they are using to gain traction on their account. You may find that they aren’t using any, so just move onto the next account when that happens. By looking at hashtags that others are using, you can see whether they work for you too. Planoly is an app for Android and iOs; there’s so many scheduling apps out there for Instagram posts, BUT I am recommending this one solely for the use of the hashtag sets. As you can see from the video below, you can create hashtag sets using your research above. Then when you come to post your pictures to Instagram, you can simply click what hashtag sets to add. Et Voila, you no longer have to think about your hashtags! At the beginning of this blog, I mentioned that you wouldn’t have to think about hashtags for 2 months. This is because it’s good to revisit your hashtag research every 8 weeks or so to make sure that you are not missing out on any up and coming hashtags that are now trendy, or that some of your hashtags haven’t been used too many times. Once they go over 1 million uses, you want to take them off your list unless you are growing your followers and engagement at a high rate. What’s that now? Pinterest? Why would I use my interior design ideas to drive traffic to my business Instagram account? Well… let’s scrap the notion that Pinterest is for interior designers and food bloggers for a moment and break down the incredible traffic-driver that is Pinterest. Pinterest is classed in the social media bracket. But here’s a crazy notion – it’s actually a SEARCH ENGINE. Yup, it’s for searching, not making connections and having conversations like all the other platforms out there. Here’s another crazy truth bomb… it doesn’t matter if your target market are using the platform or not. It’s time to scrap what you know about Pinterest’s demographics being 80% females who like to repin their perfect pillows. So with this new information, let’s attack why Pinterest is great for driving traffic and why every online business owner should have a Pinterest account. Whether it’s to your website, blog, funnel, landing page or MLM website, Pinterest is the mother of all search engines. Get your keywords and your pinning strategy right, and you could be soaring above your peers in website hits. You can see pins show up in Google search, but not many other social media platforms can do that. Twitter does sometimes, but you’re not going to write a tweet in 160 characters or less with all your keywords are you? The lifespan of a pin is also a lot longer than a tweet, Facebook post or Instagram image. Your pin is still searchable years down the line and you can still generate website hits from that 2016 pin, but I doubt anyone can find your 2016 Facebook posts! During the first 3 months of using a solid Pinterest strategy (that I learned from an absolute Goddess of a Pinterest guru, Rachel Ngom), I starting getting 1000 hits on my blog per month. Because I had only started out with my business 3 months prior to that, I was only getting 15 hits per month. So whilst 1000 isn’t a huge number, it IS a huge increase from 15. Why Drive Traffic to Instagram? With a solid Pinterest strategy, your pins will incorporate URLs to various landing pages and blogs that you create over time. You can link to anything that has a URL – You Tube videos, Facebook groups, and even your individual Instagram posts. If you are fed up with your engagement on your IG posts, why not use Pinterest to drive people from the platform to your Instagram feed? More eyes on your content means more clicks, more reads, more leads and more clients. Simples. 5) The URL to your specific Instagram post will be used in your pin. 6) Each time you post a picture to Instagram, post to Pinterest too and watch your traffic increase! Although this is just one part to your Pinterest marketing strategy, it’s good to get going with all the other elements to Pinterest, especially the use of Tailwind. Tailwind is an independently designed platform, but as it’s an official partner with Pinterest, you know it’s safe to use. Tailwind helps you schedule pins, set up smart loops so that your best pins can be repined over the course of several months, and you can also join Tailwind Tribes. Tribes are a large network of other people in your niche that share and reshare your content as you do the same for them. It’s the main way to drive traffic, so I will write another blog post on this soon. If you fancy trying Tailwind for a month for free, then here’s a gift to you as a reader of my blog! In the mean time, if you are interested in finding out more about Pinterest and getting going with an awesome traffic-driving strategy, sign up for Rachel’s Masterclass: How To Double Your Leads And Sales In The Next 30 Days Using Pinterest. It’s free! You can register here. If you are a yogi and you post on Instagram using the hashtag #Yoga, do you know how many millions of posts you are competing against to get yours seen? 59,676,703 at the time of writing this post. Not only are you competing with that many other posts, you are also being very broad with your marketing and not honing in on your target audience and niche, which is the secret to success in the online world. Let’s face it, if you conduct yoga classes in central London, you are probably not looking for people in Australia to follow you unless they are moving to London and want to find a yoga class to attend. In this short video exercise, I explain how you can do the research to use less popular hashtags on Instagram to be able to reach a much more targeted audience. There’s no harm at all when using popular hashtags that have been used millions and millions of times. However, we want to try and get you to use hashtags that are less well known so that it helps your engagement. The best way to find new hashtags for you to use is via the Instagram search function. So let’s say you are a pilates instructor, then type in #Pilates into the search bar, but do not press search. Lots of hashtags will then drop down that have the word pilates in it, and Instagram will tell you how many times they have been used. have smaller usage than a million preferably, but it’s ok to pick some that are less than 10,000 and some that are less than 100,000 too. The smaller the hashtag, that more likely that you will rank in the top posts for that hashtag, which means you will get more engagement. Once you have found a selection of good hashtags to use for your nice, copy and paste them into a notebook on your phone, or somewhere convenient so that you can access them at a later date for your posts. It’s not good to always copy and paste the same hashtags every time you post, but using a selection of them is always helpful for the algorithm to know you are not a spammy user. If you want to learn more about how to do the research for your hashtags on Instagram, take the Hashtag Quiz. It will help you understand what kind of hashtags you need to use on your account to be able to grow organically and increase your engagement. Ever wondered how to create cover images for your Instagram highlights that match your brand, stand out and make people want to watch them? 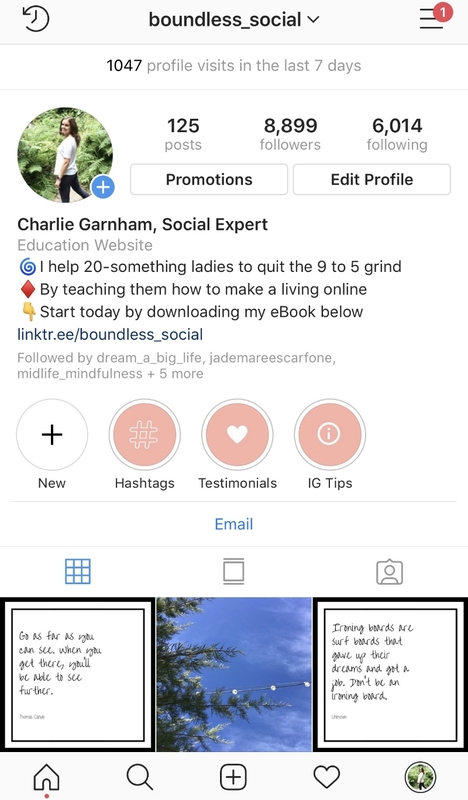 Highlights are when you use the Instagram stories that you have previously published and publicly archive them in your profile for visitors and new followers to view. Stories will only last 24 hours, but highlights are a good way to bring your stories together under 1 or more categories and they will be available forever as long as you have them in your highlights. 2) Don’t cram each category with lots of stories; people won’t want to watch through minutes of stories to see what you do. Three to 8 stories per highlight would be preferable! 3) If you have over 10,000 followers, it’s good to ensure that at least one of your stories in each highlight has a call to action to swipe up to find out more, leading to a landing page or product webpage. 4) When you create a highlight, Instagram chooses an image from your stories that you put into the highlight as the cover image. It looks much more professional to have specific cover images that match your brand, so watch the training below to find out more about how to change the cover image on your highlights. Want to learn more about how to use Instagram for your business? Join my Facebook Group: Instagram Myths Debunked.